Commander is the watchword these days, what with those sweet new cards with the C14 code being finally available to grab. So the Tribal Commander event, the last special event of 2014, couldn't come at a more topical moment. It's not this week, though: tomorrow we'll play Regular; the Commander mayhem will take place next week, on November 22. Let's hope C14 will be on Gatherling by then. Otherwise, you know the drill: placeholders and notes! It'll be wise to go through the rules in advance (I'll repeat them next week, too). You also find them here. Your 99-card main deck must contain 33 creatures of a single type, defining your tribe. The chosen tribe must be the more featured creature type in the deck. Elf, Goblin, Human, and Wizard are not allowed as tribes. Single members of these tribes can normally be included in the deck or used as a Commander. Your sideboard must include 1 single copy of your chosen Commander. 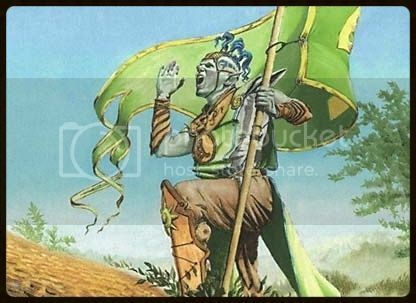 The Commander must belong to your chosen tribe, unless your tribe is allowed an off-tribe Commander (see the Off-Tribe Commanders section on the rule page). 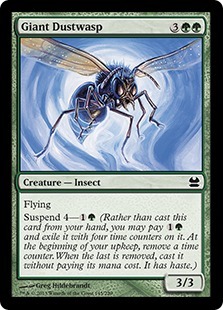 HYPOTETICAL RULE IF CHANGELINGS WORKED: Creatures with Changeling can be used in place of tribe members (Mistform Ultimus counts as Changeling). 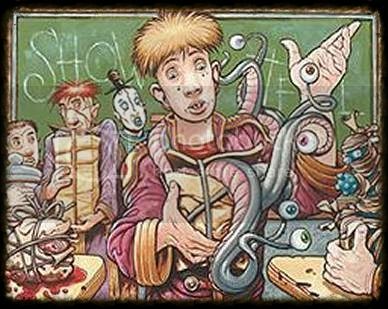 If a deck contains more Changelings than chosen tribe members, it'll count as a Shapeshifter deck. Speaking of which, the Changeling Problem has been given an official "to be fixed someday" status through this official reply on the forum thread. Fingers crossed. You may notice that this year we won't use the Joined Tribe rules (that allowed to create mega-tribes made from the union of lesser tribes). It was confusing and unnecessarily complicated for the little use it saw. Some tribes just aren't Commander worthy. The Off-Tribe Commander rules already allow for tribes that don't have a legendary member to use an alternate, off-tribe one, as listed. 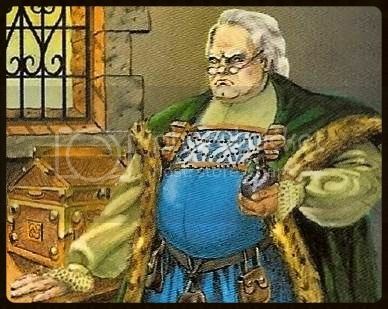 In some cases, the alternate choices are due to particular interactions with off-tribe lords (the Patron cycle, for instance), or just for flavor. For instance, Mistform Ultimus and Sakashima the Impostor are allowed as universal commanders exclusively for flavor reasons, since they're both mono-blue, so they don't fit well with most tribes. Cromat and Karona, False God are the go-to commanders for tribes that don't offer much options, if at all, or that need Changelings of several colors to be legal (the day Changelings will work again, that is). Child of Alara and Sliver Queen were too powerful choices in these cases, and the Queen is too tribal-charged herself to work as hired help. Will someone actually use one of these as commander? It might become a special prize. Nahiri, the Lithomancer: Artificer decks, Kor decks (she's the only eligible Kor commander). Most notably, Siren gets a 9th member, and Worm gets an 8th member, the first in 7 years. And it's a good one! See? Big fish eat little fish! Or fish-like creatures. So, romellos won yet another event (it's the 12th of the year for him), and again with Scouts (the 3rd of their career). But we already knew that deck, so let's focus on something else, instead. For instance, on three couples of interesting tribes. The first is a favorite of mine, Insect. After my win last month, and the consequent Entomopedia, here's the little crawlers being undefeated again, this time with a completely different build by MisterMojoRising. It's one that Mojo had experimented with in other tribes already, without much success. Could you tell that Insect was a good fit to accommodate a Restore Balance shell? Well, Giant Dustwasp is a suspend card, after all. And we've got Monstrous Carabid and Grave-Shell Scarab to dig into the deck (they actually suggest a Living End strategy as well), Bane of the Living for control, and Yavimaya Ants to deal the occasional damage while waiting for the balance. Insects are versatile! The Hornet Nest and Broodhatch Nantuko into Purphoros plan is actually enhanced here with the inclusion of Saber Ants and Fire Ants (honestly, I had forgotten about the latter when I built my deck, I might add them in future), Gleancrawler for recursion, and even Blood Artist and Hellrider off-tribe, for when you attack with all your little bugs. But no Hornet Queen (boo! ), and a Blasphemous Act/Darksteel Plate engine replacing my Earthquake/Goblin Bombardment. Different, equally solid. My tribe this time was in the Vedalken couple. I always like Vedalken ramp and the flavor of Vedalken Shackles in it. Add Trading Post, and you have a very fun deck. It turns out pfirpfel had the same idea at the same time, except with fewer support artifacts and more big monsters (or little flying deathtouch monsters), including the tribe's own potential colossus, Master of Etherium. I personally don't like to play the Master without the artifact lands, which don't synergize with the Shackles, but he can become scary big fast enough, regardless, as you can see below in the super-fun mirror match we played. Third tribal couple: Rhino. The horned hulks have been made progressively sexier over the years, culminating in that beauty that is Siege Rhino. This is AJ_Impy's way to play them: by giving Roon of the Hidden Realm a lot of great stuff to blink. MisterMojoRising's deck would certainly work better with proper fetch lands, but hey, that's a new 3-buck undefeated result! It achieves list worthiness! Finally something different from freaking Goblins! So, round 3, my Vedalken vs. pfirpfel's Vedalkens. Very proud of my gameplay in game 3, especially when I time Vedalken Shackles and Voltaic Key in the right way to negate any advantage from my opponent's accelerators. And also proud that the casual-looking Voltaic Key + Lux Cannon and Trading Post + Spine of Ish Sah delivered! Cockatrice Wants You! And Badger, too! Be the first to win a match with these new eligible tribes and you'll win a 1-tix certificate from MTGO Traders. Remember: only tribes with at least 3 members are effectively considered tribes in Tribal Apocalypse (since tribes that field an equal or greater number of Changelings than actual members count as Shapeshifter decks). Tribes with exactly 3 members are allowed to play in Underdog events with 8 slots filled by Changelings, whereas nobody else (but, of course, Shapeshifter decks) can play with more than 4 Changelings in those events. And of course this will happen only as soon as the Changelings will work on V4 as promised. The Underdog Prize: During any event of the regular rotation (but not during the one-time special events), all players who are running an Underdog Tribe are eligible for a 1-tix credit on Pennybot. The tie-breakers are first the number of Underdog categories (for instance, a tribe that's simultaneously Endangered and Unhallowed will take the prize over one that's only Endangered), then the points achieved in the final standings. During Underdog events, only the True Underdog tribes are rewarded (those are the tribes belonging to all three categories of Underdog at once). The Hamtastic Award: The Biodiversity Prize dedicated to the memory of Erik Friborg has started the fourth quarter of 2014. The quarter will end December 27. By that date, the player or players who registered the greatest number of different tribes will get a 5-tix certificate from MTGO Traders. The Tribal Achievements: The new list of achievements for the 2014 season is here. Unlock the most of them by the end of the year and you'll share a 25-tix Jackpot. The Champion's Challenge: AJ_Impy, our reigning Ultimate Tribal Champion, has issued a running challenge of his own: play with a deck featuring 4 copies of a card he'll nominate, and win at least 1 match and at least a total of 3 games with it during a single event, and AJ will reward you with 1 tix (which you'll keep as eternal memento because it's the tix the Ultimate Champion gave you). You'll be required to prove through a screenshot (or calling either me or him as witnesses, but only if we're not playing!) that you actually played the card and/or activated the card's abilities at least once during the event. The current card is... Kusari-Gama! Good luck, folks! Videos: Send us replays of your games and we'll feature them in these articles! Don't know how? Read this quick guide in 5 easy steps and start saving your tribal feats for posterity! Check out all the rules for the sub-formats! Check out the full Tribal Calendar for 2014! Vote for your favorite Elf on the Topdeck Awards! SEE YOU ALL IN THE TRIBAL ROOM! Credit where it's due, my insects were a direct descendant of yours inspired by the Entomopedia with the additions of Blood Artist and Blasphemous Act as my tech. I figured get them coming and going and did exactly that with my first game vs AJ. And it is AJ's own fault that I played at all because he pushed me to play when I was feeling reluctant and unsure of the build. Sadly my wins came from friends rather than people I don't know but that is what happens after a while at the TA. AJ, I really liked your Rhino deck last week. It is fun & competitive. 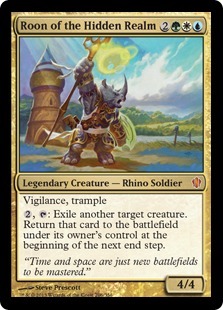 If I manage to get most of these Rhino cards, I will play with it in the future. It was a misfortune that we paired during last round, that deck deserves much better result with its dynamics. Thank you. Roon is a tad pricy but most of the rest are pretty cheap. I'll post it on the newsletter, too.